Homocysteine (Hcy) is a sulfhydryl-containing amino acid produced by intracellular demethylation of the essential amino acid methionine (Met). It is not used to make proteins but as an intermediate in methionine metabolism. Serum Homocysteine isoforms are reduced to free Homocysteine, and then exogenous S-adenosylmethionine (SAM) methylates Homocysteine to form SAH and Met, a reaction catalyzed by Homocysteine methyltransferase. SAH is then hydrolyzed to Homocysteine and adenosine (ADO) by SAH hydrolase. ADO is immediately hydrolyzed into inosine and ammonia, which reacts with glutamate dehydrogenase with concomitant conversions of NADH to NAD+ measured at ΔA340nm. Homocysteine continuously cycles through this reaction to significantly amplify the detection signal. B vitamins are important cofactors in this metabolic pathway. 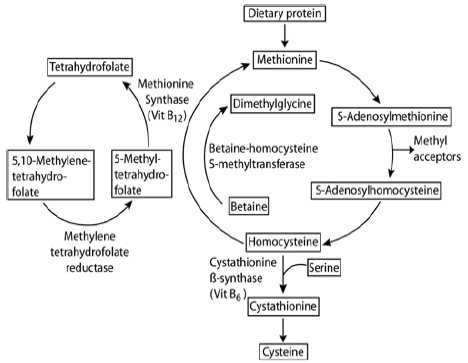 When methionine levels are low, methyltetrahydrofolate (from folic acid) donates methyl groups to generate methionine from Homocysteine, and vitamin B12 is also necessary for the methionine synthase-catalyzed remethylation of homocysteine into methionine. 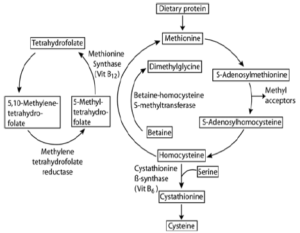 When there is excess methionine, the biologically active form of vitamin B6 catalyzes homocysteine transulfuration to cystathionine and ultimately to cysteine (excess of which is eliminated by the body). The many links between elevated plasma homocysteine and diseases that afflict the elderly point to the existence of a common denominator that may be responsible for these diseases. Whether this denominator is homocysteine itself or whether homocysteine is merely a biomarker remains to be determined. Ingestion of Met may increase homocysteine levels since homocysteine is a Met metabolite. Indeed, homocysteine levels have been increased in experimental protocols through Met supplement ingestion.39 Foods rich in Met such as meat and eggs have been associated with increased risk of heart disease, although causality between Met content and CVD has not been established. Also of interest, replacing a breakfast of refined rice with whole-grain and legume powder significantly lowered homocysteine levels in men with cardiovascular disease (CVD).41 People with elevated homocysteine are typically advised to eat less processed foods, meat, and saturated fat to lower the risk of heart disease. o exemplify the effects of lifestyle modification on homocysteine levels, a diverse group of people participated in a weeklong program that included a strict vegan diet, stress management, spirituality enhancement sessions, group support, and exclusion of tobacco, alcohol, and caffeine.45 B vitamin supplements known to reduce plasma homocysteine levels were not provided. Mean homocysteine levels declined by 13% after one week of lifestyle modification. Thus a whole diet approach high in fruit and vegetables with high natural folate content is recommended to decrease plasma homocysteine levels, with the added benefit of increasing the intake of other important nutrients as well. However, higher levels of folic acid fortification result in further homocysteine reductions, suggesting that the FDA-mandated supplementation is inadequate to optimally protect people against hyperhomocysteinemia. Therefore, if one wishes to optimally reduce homocysteine levels, despite the current lack of level I evidence supporting CV risk reduction,36,37 folic acid supplements should complement the FDA-mandated fortification program. Mild to moderate hyperhomocysteinemia indicates high risk for CVD and usually stems from poor diet, mild folate/B12/B6 deficiency, hypothyroidism, impaired renal function, or certain drugs.15,18,34,57 When the cause of moderate hyperhomocysteinemia is established, then the best treatment is reversal of this cause. Switch to high-dose B vitamins only if homocysteine clearly remains elevated and there is no MTHFR mutation (in which case riboflavin or supplementary methyl donors such as 5-MTHF or betaine may lower tHcy). Severe vitamin B12 deficiency and homocystinuria are the main causes of severe hyperhomocysteinemia (fasting plasma tHcy >100 µmol/L) and should be treated accordingly (0.02-1 mg/day of B12, 5-25 mg/day of B6 and 1-5 mg/day of folic acid),18 since it is associated with an increased pro-thrombotic state. Long-term treatment with high doses of folic acid may mask pernicious anemia caused by vitamin B12 deficiency. The high folate may correct the anemia but allow the neuropathy to progress undiagnosed, leading eventually to irreversible degeneration of the spinal cord. It is therefore important to measure B12 levels before the start of folate treatment and/or treat with folate and B12 together. Malinow MR, Nieto FJ, Szklo M, et al. Carotid artery intimal-medial wall thickening and plasma homocyst(e)ine in asymptomatic adults. The Atherosclerosis Risk in Communities Study. Circulation 1993; 87(4):1107-13. McCully KS. Homocysteine, folate, vitamin B6, and cardiovascular disease. JAMA 1998; 279(5):392-3. Manolescu BN, Oprea E, Farcasanu IC, et al. Homocysteine and vitamin therapy in stroke prevention and treatment: a review. Acta Biochimica Polonica 2010;57(4):467-477. Selhub J. The many facets of hyperhomocysteinemia: studies from the Framingham cohorts. J Nutr 2006;136:1726S-1730S. Christen WG, Ajani UA, Glynn RJ, Hennekens CH. Blood levels of homocysteine and increased risks of cardiovascular disease: causal or casual? Arch Intern Med 2000;160:422-434. Broekmans WM, Klopping-Ketelaars IA, Schuurman CR, et al. Fruits and vegetables increase plasma carotenoids and vitamins and decrease homocysteine in humans. J Nutr 2000;130:1578–83. Jang Y, Lee JH, Kim OY, et al. Consumption of whole grain and legume powder reduces insulin demand, lipid peroxidation, and plasma homocysteine concentrations in patients with coronary artery disease: randomized controlled clinical trial. Arterioscler Thromb Vasc Biol 2001;21:2065–71. Nygård O, Refsum H, Ueland PM, Vollset SE. Major lifestyle determinants of plasma total homocysteine distribution: the Hordaland Homocysteine Study. Am J Clin Nutr 1998;67:263–70. Stolzenberg-Solomon RZ, Miller ER 3rd, Maguire MG, et al. Association of dietary protein intake and coffee consumption with serum homocysteine concentrations in an older population. Am J Clin Nutr 1999;69:467–75. Stanger O, Weger M. Interactions of homocysteine, nitric oxide, folate and radicals in the progressively damaged endothelium. Clin Chem Lab Med 2003;41(11):1444-1454. Thomson MJ, Puntmann V, Kaski JC. Atherosclerosis and oxidant stress: the end of the road for antioxidant vitamin treatment? Cardiovasc Drugs Ther 2007;21:195-210. Weiss N, Heydrick SJ, Postea O, et al. Influence of hyperhomocysteinemia on the cellular redox state – impact of homocysteine-induced endothelial dysfunction. Clin Chem Lab Med 2003;41(11):1455-1461. El Oudi M, Aouni Z, Mazigh C, et al. Homocysteine and markers of inflammation in acute coronary syndrome. Exp Clin Cardiol 2010;15:e25-e28. Antoniades C, Antonopoulos AS, Tousoulis D, et al. Homocysteine and coronary atherosclerosis: from folate fortification to the recent clinical trials. European Heart J 2009;30:6-15. Lentz SR. Mechanisms of homocysteine-induced atherothrombosis. J Thromb Haemost 2005;3:1646-54. Liao, D, Tan, H, Hui, R, et al. Hyperhomocysteinemia decreases circulating high-density lipoprotein by inhibiting apolipopotein A-1 protein synthesis and enhancing HDL cholesterol clearance. Circ Res 2006; 99:598-606. Martínez-Chantar ML, García-Trevijano ER, Latasa MU, et al. Importance of a deficiency in S-adenosyl-L-methionine synthesis in the pathogenesis of liver injury. Am J Clin Nutr 2002;76(5):1177S-82S. Ventura P, Rosa MC, Abbati G, et al. Hyperhomocysteinaemia in chronic liver diseases: role of disease stage, vitamin status and methylenetetrahydrofolate reductase genetics. Liver Int 2005;25(1):49-56.
de la Vega MJ, Santolaria F, González-Reimers E, et al. High prevalence of hyperhomocysteinemia in chronic alcoholism: the importance of the thermolabile form of the enzyme methylenetetrahydrofolate reductase (MTHFR). Alcohol 2001;25(2): 59-67. Friedman AN, Bostom AG, Selhub J, et al. The kidney and homocysteine metabolism. J Am Soc Nephrol 2001;12(10):2181-9. Righetti M, Tommasi A, Lagona C, et al. Effective homocysteine-lowering vitamin B treatment in peritoneal dialysis patients. Perit Dial Int 2004;24(4):373-7. Morris MS, Bostom AG, Jacques PF, et al. Hyperhomocysteinemia and hypercholesterolemia associated with hypothyroidism in the third US National Health and Nutrition Examination Survey. Atherosclerosis 2001;155(1):195-200. McCaddon A, Davies G, Hudson P, et al. Total serum homocysteine in senile dementia of Alzheimer type. Int J Geriatr Psychiatry 1998;13(4):235-9. Werder SF. Cobalamin deficiency, hyperhomocysteinemia, and dementia. Neuropsychiatr Dis Treat 2010;6:159-95. Hermann W, Obeid R. Homocysteine: a biomarker in neurodegenerative diseases. Clin Chem Lab Med 2011;49(3):435-441. Fava M, Borus JS, Alpert JE, et al. Folate, vitamin B12, and homocysteine in major depressive disorder. Am J Psychiatry 1997;154(3):426-8. Beydoun MA, Shroff MR, Beydoun HA, Zonderman AB. Serum folate, vitamin B-12, and homocysteine and their association with depressive symptoms among U.S. adults. Psychosom Med 2010;72(9):862-73. Hvas AM, Juul S, Bech P, et al. Vitamin B6 level is associated with symptoms of depression. Psychother Psychosom 2004;73(6):340-3. Lombardo F, Sgrò P, Gandini L, Dondero F, Jannini EA, Lenzi A. Might erectile dysfunction be due to the thermolabile variant of methylenetetrahydrofolate reductase? J Endocrinol Invest 2004;27(9):883-5. Vine AK. Hyperhomocysteinemia: a new risk factor for central retinal vein occlusion. Trans Am Ophthalmol Soc 2000;98:493-503. Refsum H, Smith AD, Ueland PM, et al. Facts and recommendations about total homocysteine determinations: an expert opinión. Clin Chem 2004;50:3-32. Yaman H, Akgul EO, Kurt YG, et al. Plasma total homocysteine concentrations in a Turkish population sample. Acta Cardiol 2009;64(2):247-51. Smulders YM, Blom HG. The homocysteine controversy. J Inherit Metab Dis 2011;34:93-99. Clarke R, Halsey J, Lewington S, et al. B-Vitamin Treatment Trialists’ Collaboration. Effects of lowering homocysteine levels with B vitamins on cardiovascular disease, cancer, and cause-specific mortality: Meta-analysis of 8 randomized trials involving 37 485 individuals. Arch Intern Med 2010;170(18):1622-31. Wang X, Qin X, Demirtas H, Li J, et al. Efficacy of folic acid supplementation in stroke prevention: a meta-analysis. Lancet 2007;369:1876-1882. Nieto FJ, Comstock GW, Chambless LE, Malinow RM. Coffee consumption and plasma homocyst(e)ine: results from the Atherosclerosis Risk in Communities Study. Am J Clin Nutr 1997;66:1475–85 [letter]. DeRose DJ, Charles-Marcel ZL, Jamison JM, et al. Vegan diet-based lifestyle program rapidly lowers homocysteine levels. Prev Med 2000;30:225–33. Moens AL, Vrints Cj, Claeys MJ et al. Mechanisms and potential therapeutic targets for folic acid in cardiovascular disease. Am J Physiol Heart Circ Physiol 2008;294:H1971-H1977. Dierkes J, Kroesen M, Pietrzik K. Folic acid and vitamin B6 supplementation and plasma homocysteine concentrations in healthy young women. Int J Vitam Nutr Res 1998;68:98–103. Stein JH, McBride PE. Hyperhomocysteinemia and atherosclerotic vascular disease: pathophysiology, screening, and treatment. Arch Intern Med 1998;158:1301–6. Food standards: amendment of standards of identity for enriched grain products to require addition of folic acid. Fed Regist 1996;61:8781–97. Jacques PF, Selhub J, Bostom AG, et al. The effect of folic acid fortification on plasma folate and total homocysteine concentrations. N Engl J Med 1999;340:1449–54. McNulty H, Dowey LR, Strain JJ, et al. Riboflavin lowers homocysteine in individuals homozygous for the MTHFR 677C>T polymorphism. Circulation 2006;113:74–80. Ueland PM, Hustad S, Schneede J, et al. Biological and clinical implications of the MTHFR C677T polymorphism. Trends Pharmacol Sci 2001;22(4):195-201.
dbSNP – Database for short genetic variations. http://www.ncbi.nlm.nih.gov/projects/SNP/snp_ref.cgi?rs=1801133. Accessed May 2011. Wilcken DEL, Wilcken B, Dudman NP, Tyrrell PA. Homocystinuria—the effects of betaine in the treatment of patients not responsive to pyridoxine. N Engl J Med 1983;309:448–53. Olthof MR, Brink EJ, Katan MB, Verhoef P. Choline supplemented as phosphatidylcholine decreases fasting and postmethionine-loading plasma homocysteine concentrations in healthy men. Am J Clin Nutr 2005;82:111–7. Olthof MR, van Vliet T, Boelsma E, Verhoef P. Low dose betaine supplementation leads to immediate and long term lowering of plasma homocysteine in healthy men and women. J Nutr 2003;133:4135–8. Ogbonna G, Gottermeier G, Fox LS. Non-fasting plasma total homocysteine reference interval using the Vitros homocysteine assay standardized against NIST SRM 1955.Clin Chim Acta 2008;388(1-2):225-7.